I am going to rant here for just a minute. Typically, I don't mind when the neighbor kids come over to play. My kids love it. The great outdoors is so much funner (Ryan's word) when there are friends to play with. I especially like that they seem to be able to entertain themselves for hours. Did you notice my bolded word?? H-o-u-r-s! That is time that my house comes to a standstill, the vibrations from running, jumping, crazy kids comes to a halt and my head comes out of the spin and I find myself faced forward. We had this wonderfully, sweet older lady that lived behind us. Her name was Mary and she loved to do yard work. Everytime she was outside, she'd take a few minutes to chat with my kids or myself. Then, a couple years ago on Christmas Eve, she died. The family had to sell the house. When this happens, you get new neighbors. I so had this idea that we would have wonderful neighbors who we got along great with and we'd help out from time to time when they were on vacation and so on. Do you envision my idea of walking through the meadow, dancing with the butterflies??? This is so not reality for us. We do have a few neighbors that we are more friendly with but they happen to be the ones without children. Hmmm.....maybe there is something to that???!! The new neighbors have been pretty friendly but there have been quite a few different faces of people living there and I'm perplexed as to who is who and who is the real owner. I see a little boy there quite often and I assume he is younger than Kara. Needless to say, we haven't had many problems. One of the young ladies has apparently taken on a babysitting job and I can only hope that it doesn't last all summer. (Ooops...I suppose I shouldn't say that because perhaps there is a real need there. Life isn't all about me!) Ok, let me rephrase that, I hope that I am not having to be the bouncer all summer long. Out of politeness, I always require that my children check to make sure it is alright with the parents if they can go into backyards to play and I always want that politeness from other people towards our backyard. However, the babysitting young lady isn't familiar with my law of backyard politeness. The three kids she is watching are 5, 4 and 2. She's been popping them over the fence for them to play without even checking to see if that was alright with us. I didn't say anything to her because I thought to myself...oh, just let them play for a little bit and then you can send them home while we eat. Well, in two seconds flat, the three girls had everything in a stir. They quickly became known as the 'mean girls'. I felt that I needed to be out there with them during this visit. The thing that got me is that as soon as the babysitter popped them over the fence, she disappeared and I became the babysitter. They were our visitors until I sent them home so my kids could go to bed. Today, first thing this morning, I looked out my window and who do you think I saw? Yes, indeed....I saw the three little girls that came to visit yesterday. I was so hoping that they weren't popping over the fence before I had my coffee. Much to my surprise, they didn't come for a visit until late this afternoon. However, they were here for two seconds and I had to send one of them home for trying to kick Kara down the slide and then proceeded to tell me she didn't have to listen to me. Of course, I set her straight. The funny thing is, while I was standing there having this stern conversation with this five year old, the babysitter was just sitting there in her lawn chair texting whoever without any concern as to what was going on. Interesting, I thought to myself. The little girl was back in my yard, five minutes later. 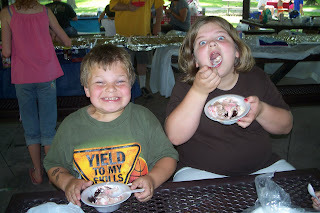 Today was our homeschooling Ice Cream Social event. The kids had such a great time! 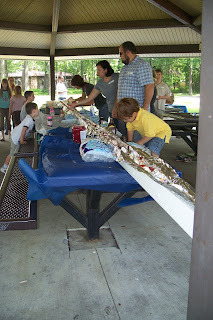 They had made a 40 foot long ice cream sundae which thrilled the kids to death. Ice cream is the name of the game for our family. You just can't go wrong with that. I think our oldest said he had four bowls which was about the amount our four year old had. Wow! 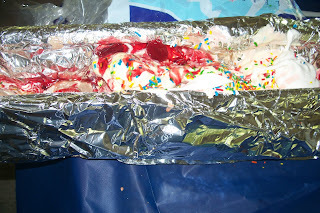 The day was full of running around the park, eating more ice cream and let's not forget to mention the brownies they had to go along with it. They had hillbilly horseshoes and a bounce house on top of all that. They were forecasting storms and rain but it all held off for our event and God sent the sunshine! It turned out to be an absolutely beautiful day. My grandpa and grandma bought a membership at a family resort a few years ago on the idea that it would be something our whole family could enjoy and even vacation together. It was also a place for him and grandma to get away to that wasn't too far away but just enough that it was relaxing. The resort is Outdoor Adventures. 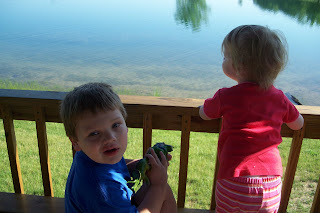 They have several of the resorts around Michigan but our favorite is the Lake Shore Resort. It's the bigger of the resorts and has many more options available to the member. For example, they have a beach on Lake Linda, they also have an indoor and outdoor pool, a cafe, putt putt golfing, kayaking, planned activities and so much more. 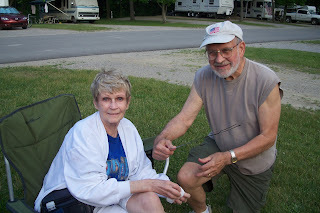 Last week was our week to go camping in our travel trailer and grandpa and grandma rented a little cabin. 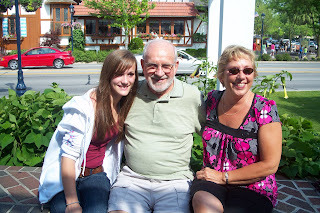 The kids love the time they get to spend with grandpa and grandma along with all the fun things there are to do. I tried to get them to slow down and not do everything on day one but they were determined to wear me out! Ryan got to be a hero and save the day. Grandpa had locked his keys in his cabin and contacted the maintenance guy to let them in but he didn't have the right keys. So Ryan got to climb in their window and unlock the door thus saving the day! He was pretty proud of himself. 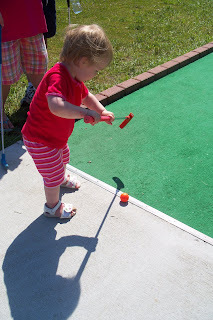 One of the days we were there, I took all of the kids putt putt golfing. Yes, I even took little Kara. She is wicked with the golf club as she swings it around in the air. She loved the game but after awhile she just wanted to carry her ball to the hole and just throw it in. Aaron got tired of the way you are suppose to play and decided it was much more efficient to place the ball near the hole, lay on the ground and shoot the ball into the hole billiard style. It became a little chaotic when Kara was throwing her ball into the water, me trying to get it out then running in the other direction to get Aaron to stay with us since the game goes quite a bit quicker if you play his way. By the time this game was over, I was about comatose and in need of a Venti Frappuccino but much to my disappointment, they didn't have a Starbucks shack on the premises. Maybe I should jot that down on the suggestion card. We took a trip to the beach. I usually avoid beaches due to the gross water and bathing suit attire issues but I caved in and took the crew. I could so write another post on this particular subject. I had contemplated taking pictures with my camera phone to upload here so you could see what I saw but I changed my mind. I just don't understand why bigger women want to wear bathing suits that are missing material. I will stop there. The kids had a great time running and jumping and splashing and throwing mud at each other. They ALL slept the night through. I guess it did have it's benefits. They had a Father's Day card making activity for the kids which we went to. They loved having a craft to do. Ryan made his card for grandpa and insisted putting grandma on it too. He carefully drew a picture of himself between grandpa and grandma because he loves them. Then he was itching to go give it to him before anybody else was finished. He is quite a character. Kara got quite attached to grandma. The first thing she wanted to do as soon as she got up every morning was 'walk, walk' down to grandma's cabin. Everytime Kara would get a glimpse of her, she'd start talking in her sweet high pitched voice....'grandma, grandma, grandma' along with taking tiny little marching steps. I wish I could have gotten that on video! It was priceless. 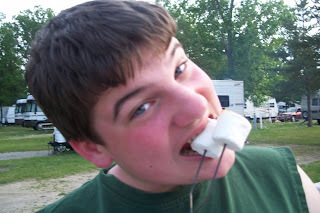 We spent the evenings roasting marshmallows and sitting around the campfire. This is one of my favorite things about camping. When the day is quieting down, the smokiness of the fire and the warmth of the company sitting around talking and reminiscing, those are memory making moments. My sister in law, Pam, had her baby this week. A little girl named Emma Collette. We haven't had a chance to to see her yet but I will post some pictures when we do. While my aunt was still in town, we decided to all meet up at a family favorite restaurant, Zehnders. Some of my fondest memories are of eating there as a family since way back when. So it really was an appropriate place to dine. I love their homemade noodles and their vidalia onion soup.....yum-o! This year my kids were all happy to see the walking chicken named Drumstick. A couple years ago, Ryan, just loved that chicken so much that he didn't want it to go. I do think he would have invited him to sit and eat with us but alas, a chicken has to do what a chicken has to do. So upon our perusing the little stores they have beneath the restaurant, we found a stuff one and bought it for him. A few months later, that very chicken left this world for chicken heaven. Ryan was trying to help me cook and he threw that stuff thing on my gas stove. Thank goodness I have a quick hand. It left a nice little burnt spot and the smell......well, have you ever smelled stuffed animal material singed? Not a pleasant smell. It didn't remind at all of the chicken we eat at this wonderful restaurant. My aunt's visit has come to end and I'm sure she will need a nap when she gets home. I know she wore my Mom out but in a good way. We have some new fond memories to cherish. My Aunt has come in to town. We haven't seen her in four years. We were excited that she had the opportunity to come up for a visit. However, when you go visit your home state, there are a lot of people to see in just a short time. How you handle that is, have several of the relatives over at one place, at one time, throw in some yummy desserts and you've got a party. My house was the chosen party destination......and I found out about it the day before. I always enjoy entertaining and I love it when my great aunts, uncles, and grandparents get together so it was a wonderful opportunity to have them over. However, if you have children, you homeschool, run a business along with life in between and cleaning seems to always drop down to the bottom of the list, a day's notice is sometimes not enough to get your house in order. I must admit that there was some yelling involved to get the children motivated. Ok, maybe there was a smitch more than little. They just did not see what I was all up in a stir about. After all, it was just family coming over. Overall, the kids did a great job at helping. The house was presentable...not perfect, but presentable. However, I still had the deserts to put together. For that to happen, I needed to run to the store and I also needed time to take a shower. With only three hours before party time, I grabbed my purse and headed out the door. When I got to the car, I thought to myself, why is there all this condensation on the driver's side window? Then, I realized it wasn't condensation but that is was shattered. A huge groan escaped my being. I surely didn't have time for this nor was this convenient financially or timely. What could have done this and where was the person who did it. I needed to explain to him/her how this just was not on my agenda for today. Someone needed to pay or at least let me rant and rave while I was jumping up and down in a fit. Have you ever talked to yourself? Well, I did at that moment. I was already stressed beyond belief and I didn't need a dumb ol' window sending me over the edge. I took a few deep breaths and muttered to myself that it didn't matter how it happened, it just happened. We needed to take care of the situation and continue on with what needed to be done. After my husband and I grumped at each other for a little bit, we took the next step. 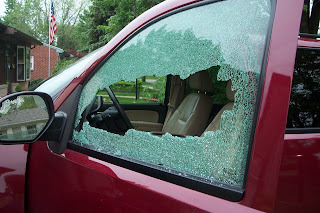 A quick call to the police to make a report for our insurance company was made. Of course, it wasn't an emergency so we waited and waited and waited. After he came and went, we had to take it to the repair shop and clean all the glass up off of the ground. What a mess! Thank goodness I had made the brownies for my trifle earlier that morning. My husband offered to run to the store for me while I took my shower. That worked out splendidly. In the end, my trifle got made, my hair got done and my house was presentable. I could breathe a sigh of relief. Inspite of all the chaos and crisis we had during the day, the party went smoothly and everything came together like it needed to. It was great seeing everybody and catching up on what's going on with each of them. As to the car.....I am so thankful that the damage to the car fell under the smaller of the two deductibles. What a day! 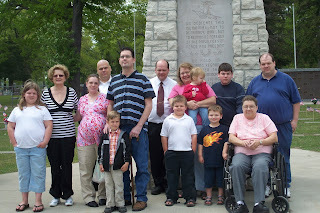 My father in law passed away back in January. He was cremated and we had a memorial service at the church at that time. However, what to do with the ashes has not been decided until recently. It just didn't seem settled until now. 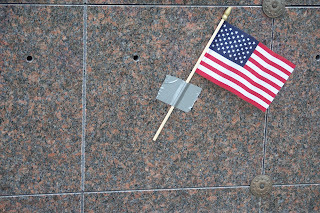 Grandma Loretta decided to have the ashes placed in a Veteran's cemetery. Bob's Dad was very proud to have fought in the war, to have fought for our country so it was very fitting that he be placed there. 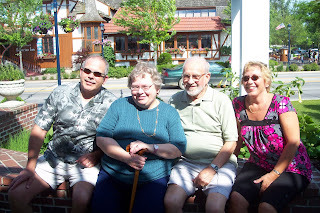 Several of the family got together including my brother in law, Dave, who just got out of the hospital a week ago. We all gathered around and my husband prayed. It was an emotional time for all of us. He is very missed. We all had dinner afterwards at a restaurant named the Riveria. It was right on the lake and we sat where we could watch the boats. The kids loved it. The ferry boat entrance was right next to the restaurant which totally enthralled Ryan and Aaron. To watch the semi trucks getting on the ferry boat truly amazed them. The bus boy will have to wash the windows where the boys had their hands and faces glued to the window. After we stuffed ourselves with the over-indulgent portions, we sat on the dock watching more boats go by. I think the kids will remember this day for a long time.